I have a day off today so posting early. :-) Autumn has set in today, dreary, cold and windy, maybe it's more like winter. 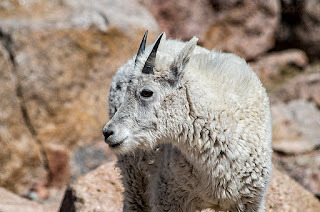 My image today is from a while back and a visit to Mount Evans in Colorado. It was very cold and extremely windy while I was up there due to the elevation. This Mountain Goat that I was able to get a good image of had a nice wool coat to protect it, I just had a wind breaker. I was happy to be able to see Mountain Goats up close and get some good images of them.